Jalopnik reader austinthebruiser works for Zytek. Jalopnik reader austinthebruiser works for Zytek. Zytek's hybrid system is in the Japanese SUPER GT Honda CR-Z. 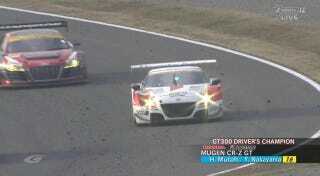 The Honda CR-Z just won the SUPER GT GT300 class championship this year. Congratulations to austinthebruiser!